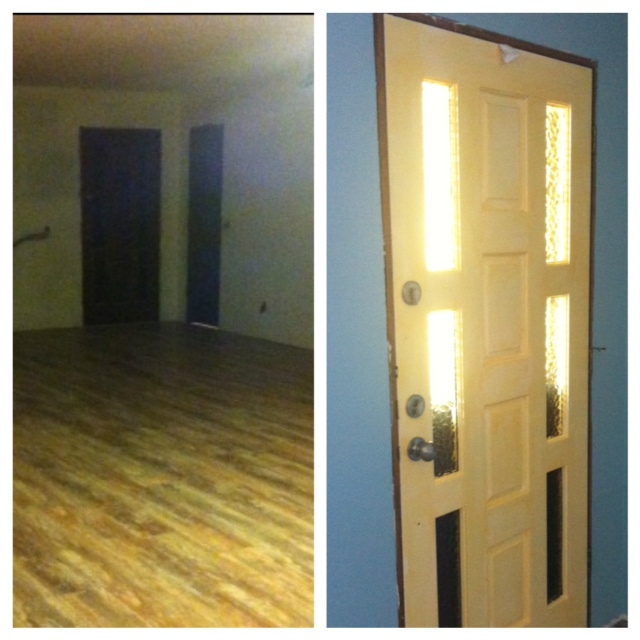 Remember my dated dungeon (aka: living room)? It was so dark and almost claustrophobic because of the cage, the color, and the panels. I love a light and airy room that seems open and has a lot of natural light. 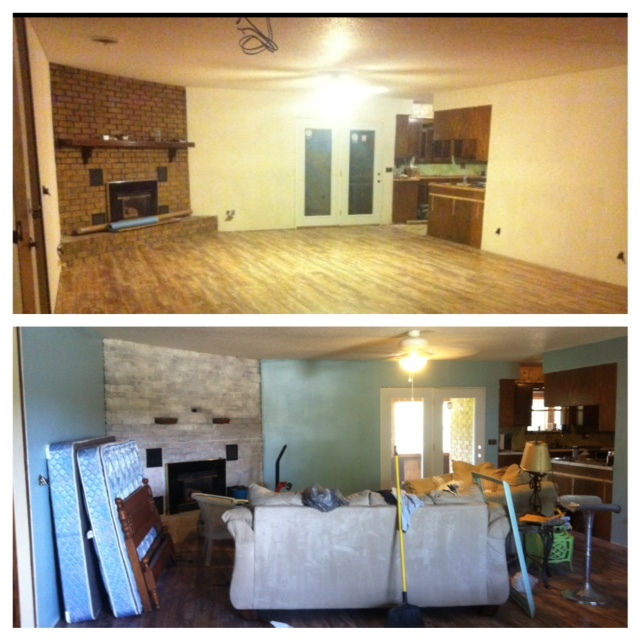 The living room needed a massive overhaul, and with new sheet rock, new floors, new light fixtures, new windows, new french doors, fireplace makeover, and now new paint, it has definitely received an overhaul! 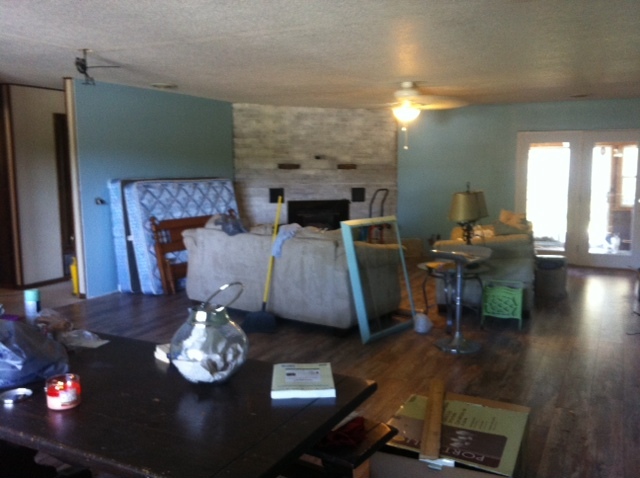 I’m keeping the dark wood trim (only because budget is not going to allow repainting all 2,100 sq. feet of it!). But I am bringing in as many light colors as possible. My search for just the right/not country blue was exhausting! I think I brought home every blue paint sample in the area, and I finally found a color I love. 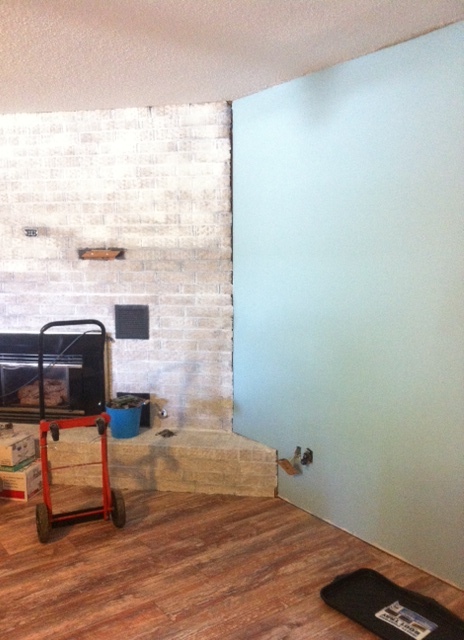 I chose High Noon in Valspar from Lowe’s. 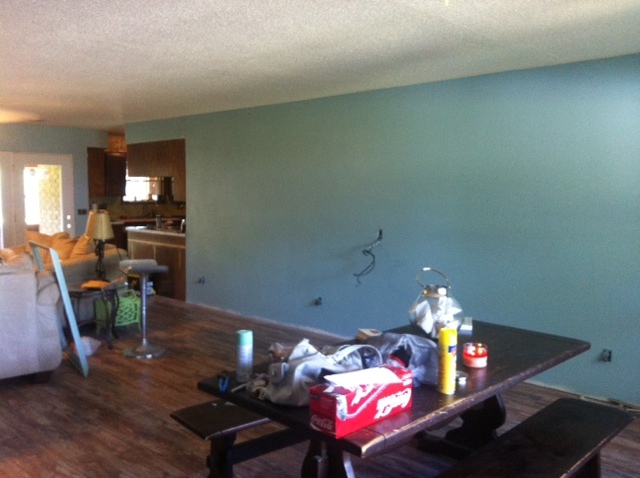 It looks light blue in some light and blue with a hint of green in other light. I love it! 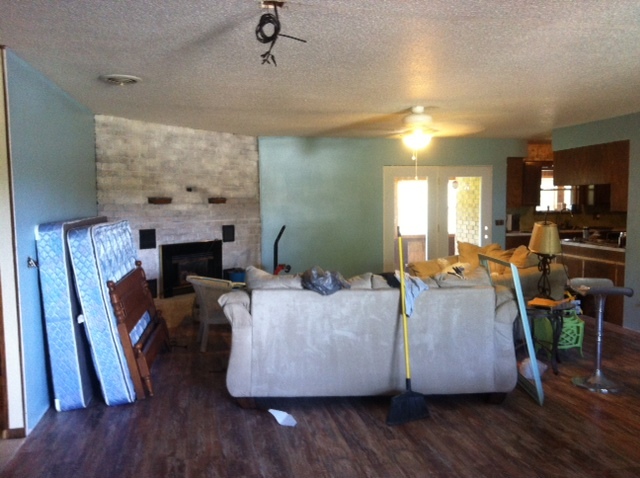 The distressed floors, new french doors, white-washed fireplace, and blue walls seem so beachy and airy to me. It’s definitely quite the transformation from the dark dungeon. The High Noon blue is very similar to some of the distressing colors in the floors. 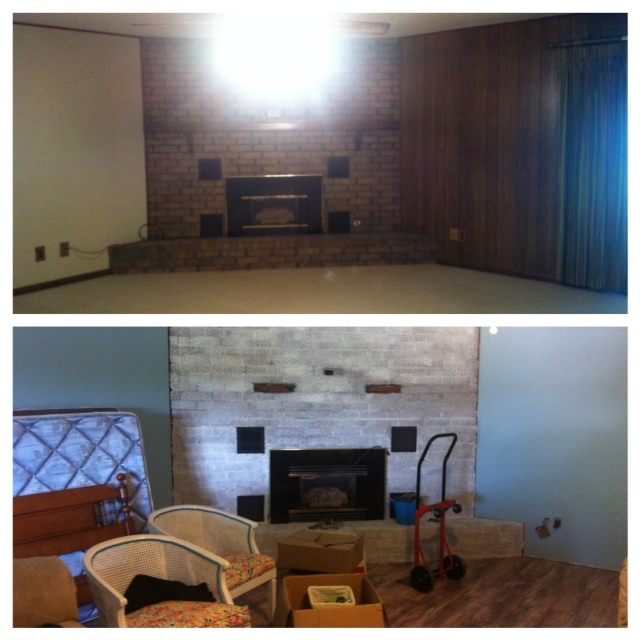 I love the contrast, and I LOVE how the fireplace now stands out as the focal point. 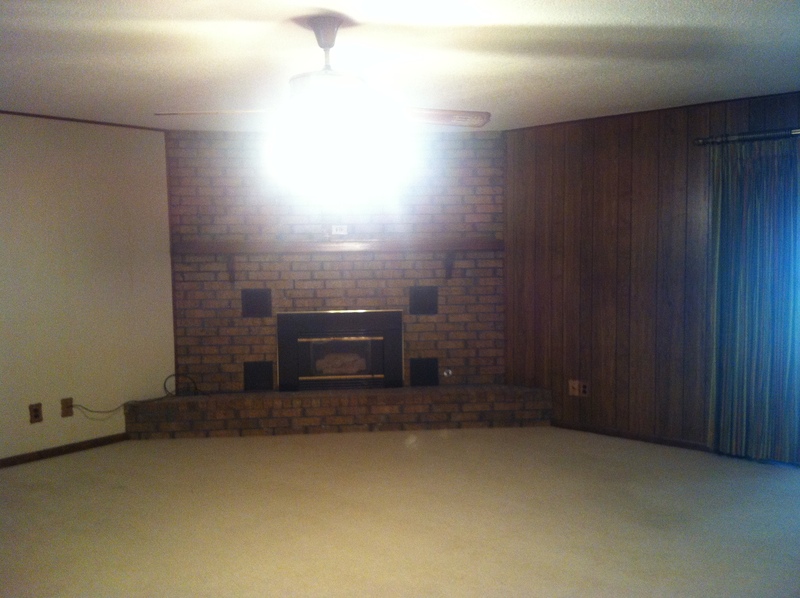 Previously, it just blended right in because the floors, wall, and fireplace were all the same color. I think these three elements together are my favorite part of the house so far! Rustic charm but still modern and airy! I can’t wait to get it all finished. 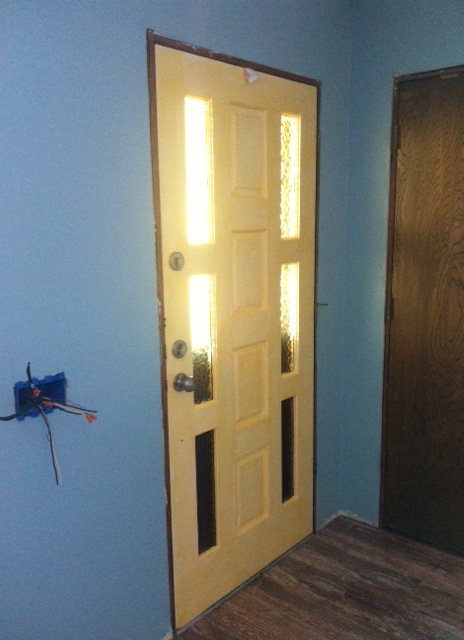 Another favorite change is my remodeled front door with the High Noon blue. Looks so good!